This paper discusses two topographical works: Wordsworth's Guide to the Lakes, which some regard as the best guidebook to that region of England ever written, and the extraordinary series of guidebooks to that area written and drawn from the 1950s onwards by Alfred Wainwright. Wordsworth's book may be admired less, perhaps, for its accuracy of detail than for its anticipation - even creation - of an attitude to physical presence in (rather than mere observation of) scenery. It is that attitude which is argued eventually to demand a new form of writing and utterance, best represented in Wainwright's meticulous MSS, reproduced exactly as books, which describe routes of ascent, traverse and descent for each of the hills in turn. Wainwright's intimate style creates a relationship with his individual readers, premised on their sharing the same 'no-nonsense', democratic, anti-authority values. Wainwright's quirks are no more hidden than they would be in conversation, and are literally inscribed onto the landscape he depicts. 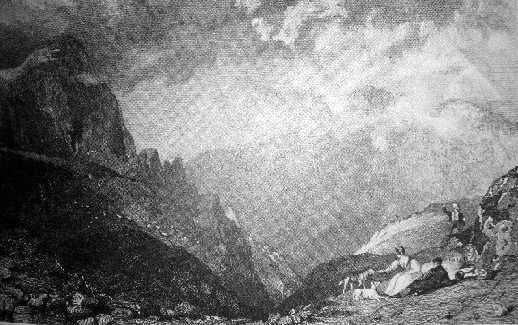 The Prophet Isaiah's (xl.9) injunction to 'get thee up into the high mountain' was to enable the expression of joy at good tidings... Perhaps this constitutes high authority for the centrality of mountains in our cultures. There are two poles to this talk: Wordsworth's Guide to the Lakes and its cultural context, and Alfred Wainwright's series of Pictorial Guides to the Fells of the English Lake District, recently saved from premature putting out of print. Those two works - from say 1820 to 1960 - bracket a period of immense change in attitudes to the countryside and mountains, which in part they precipitate. They also mark radical changes in the way Europeans write about and apprehend mountains, which our mediaeval and eighteenth century forebears regarded with distaste if they could not reduce them to allegory - Petrarch ascending Mont du Ventoux - or sensible cultivation. In all these works, there is a stress on the visual 'Picturesque' - and this is reflected in how tourists wrote. 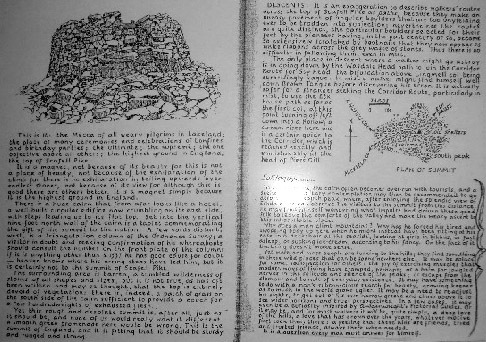 Gray's fine journal, for example, describing Blencathra, shows no sense of the ground underfoot, only of the views. 'Romantick' visions of landscape dominate: set out the best viewpoints for the tourist (which are also noted on maps like that by Crosthwaite of Derwentwater, published in1783). All these guides and maps are designed for use with the Claude glass - the tinted convex mirror that most people of taste and means carried. (One might remark in passing the huge influence of Claude le Lorrain on polite perceptions of landscape). Indeed, the very word 'scenery' is a new invention: OED gives it as = 'a landscape or view, 1777', 'general appearance of a landscape regarded from its picturesque point of view, 1784'. This emphasis is noticeable even in the maps which begin to be produced for tourists and travellers -one of the most interesting, and earliest, examples is Smith's New and Accurate Map of 1800, which, linen-mounted, in a slip case for the pocket, is the remote ancestor of today's Ordnance Survey Outdoor Leisure map. But all the routes it gives are valley routes, specifically to viewpoints for the 'picturesque', from which the eye can compose the landscape into artistic form that will elicit refined feelings of awe in the viewer. It is interesting how often these guides refer to Claude and Salvator Rosa, and how revealing that is about the economic and cultural context of their expected readership. 'Experience-in-landscape' is being converted into something else: the 'picturesque' allows the illusion of possession, as of a work of art, but one you have composed yourself: and it is open only to those privileged by leisure and status. What is most original is the remarkable and powerful 'Description of the Scenery' as if from an aerial perspective, the description of the forms of the Mountains, the surface underfoot. A fine example of this sensibility is Dorothy's description of the walk to Scawfell [sic] Pike. They go from Rosthwaite to Seathwaite, then to 'Ash-course' [Esk Hause] , and there enjoy the view of Borrowdale, Keswick, Bassenthwaite, Solway in one direction, Langdale and the Duddon Valley in the other, Ingleborough to the east, and Eskdale to the west. (One can work out exactly where they sat - or the more than one place at which they sat!) But the point of view is still painterly: the 'deliciousness of the third prospect (itals. mine) [of Eskdale]...favoured by sunshine and shade'. They were tempted on by the view of Scafell - only to find, like so many since, Mickledore in the way. Contented with the Pike, which was 'estimated as higher', they ascended it with 'much toil, though without difficulty'. Dorothy gives a detailed and accurate description of light and shade, clouds, plants, rock - she uses close as well as long focus. 'Scawfell and Helvellyn the two Mountains of this region which will best repay (itals. mine) the fatigue of ascending them'... with what?? With views, with the apprehension of 'the sublime' - Dorothy seems to have been completely in sympathy with Wordsworth's mystical response to Nature as a spiritual influence on the discerning mind. Through the beloved retreats your arms enfold! Swept onwards, did the vision cross your view? But by 1848 Bradshaw is publishing Railway and Steamer timetables for the Lake District, with guide and map: the day trip is born. That first cheap access for the populations of the industrial towns, that first Victorian trickle along the Oxenholme to Windermere line, is now a flood, so that there is now talk of restricting car access to certain valleys and the hill paths are eroding badly under the unremitting tramp of walkers' boots. By 1930, the day trip was common: the railway went to Keswick, to Windermere, to Cockermouth, to Furness, to Ravenglass. Innumerable coach parties made loud the vale, and the day of cheap cars was yet to dawn. Already in the 20s and 30s, walking prodigious distances over high hills had become one of the things young, often radical, intellectuals did: a combination of muscular agnosticism (if not atheism), the Cultivation of the Body and Triumph of the Will. And where Wordsworth's proposed reader was a person of substance, enjoying cultured leisure, free from the exigencies of ploughtail, counting house, or shippon, 'Wainwright' is essentially the guidebook for the leisure generation that developed during the years of affluence after the 1950s, whom the intricate timetable of Ribble buses brought to all parts of the Valleys. 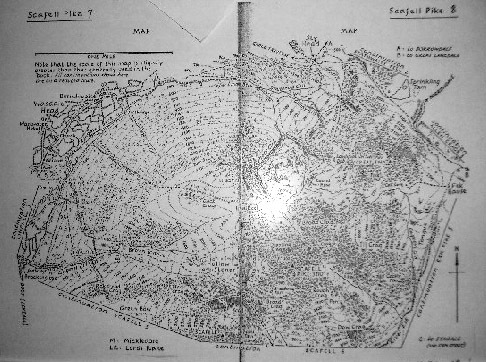 Alfred Wainwright's (1907-91) seven books, each for one division of the Lakeland Fells, cover in all 214 hills. (The books are listed at the end of this article). 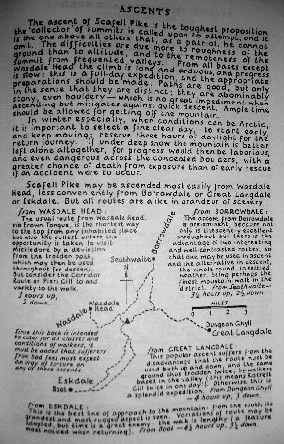 These meticulous MSS, reproduced exactly, have greatly influenced other writers of guidebooks to other parts of the UK, though few equal Wainwright's detail or match the elegance of his occasional acerbity. 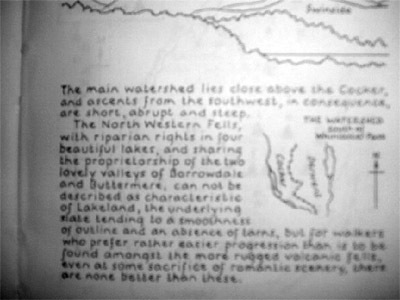 Wainwright did not like people: he depicts a landscape without people, or if there is a figure, it is turned away, perhaps smoking a pipe - Wainwright drawing himself out of the picture. Book 5 is dedicated to 'those who travel alone, the solitary wanderers on the fells, who find contentment in the companionship of the mountains and of the creatures of the mountains'. Wainwright shunned celebrity, avoided casual acquaintance. There was time when walkers in pubs at the end of the day reported 'sightings', but few reported 'speakings'. The wealth the books brought him was in the end left to an animal charity in Kendal, where he had had a humble clerk's job all his life. 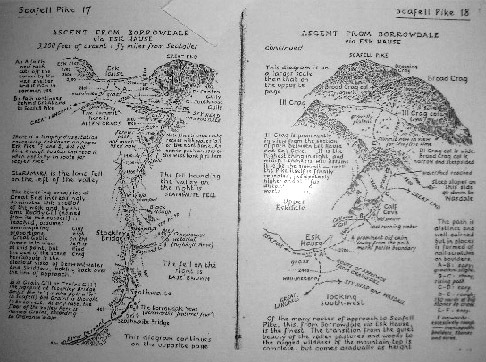 The books describe routes of ascent, traverse and descent for each hill, giving maps and identification sketches of the views. Emphatically not rockclimbing guides, they are for the humble (and proud of it!) walker, and Wainwright's intimate, familiar, conversational style creates a relationship with his individual readers, premised on their sharing the same 'no-nonsense', democratic, anti-authority values: Manchester Corporation is a particular bête-noire. Wainwright's personal likes are no more hidden than they would be in conversation, and are literally inscribed onto the landscape he depicts. 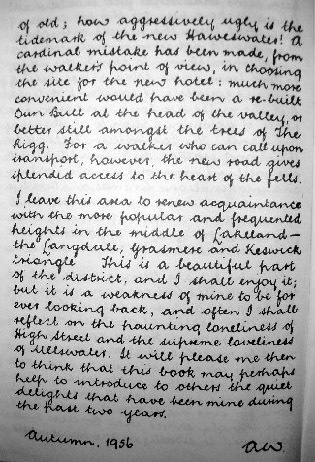 and the books rapidly developed a public and a readership who would never walk the majority of the routes, but who came to 'know' the Lakes as a text and to enjoy them in a literary diversion. I have 'read' all 214 hills: I know - have walked on - about 40 of them. About the only things Wainwright did not give you were colour and weather. But the books were used on the hills: 'what does Mr Wainwright say?' my children often asked, and certainly the routes he recommends became (so to speak) institutionalised, with resulting erosion from heavy use. 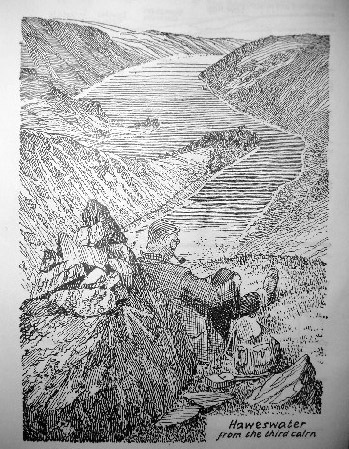 By an irony he would not have enjoyed, the books of this private, solitary man, who abhorred the organised and the group, drew people into the hills, and made into places loud with talk and bright with hi-tech shell clothing, those spots where his tweed-clad figure smoked his pipe in silent, almost religious, contemplation of the mountains. He loved mountains, almost vivifying them as Wordsworth did in the Prelude: The mountains become personified, owners of the valleys. Yet the priority his books have given to certain routes have made other parts of the hills less trodden, less known, than they have been for many years - perhaps for centuries, as the farming of this landscape takes yet another downward turn with the long depression in sheep farming, exacerbated now with the aftermath of the foot and mouth epidemic. Compare the narrative of Dorothy Wordsworth with the pages illustrated in Figurs 4ff again. For Dorothy, the view is sublime; for Wainwright, the minutiae of bodily effort and the texture, so to speak, of the hill are the key things. Wainwright's writing invites us into the physical space, but, paradoxically, in so doing displaces the places into remembrance , at least, of its description. We see within the framework of what we have been told to see. Yet his books permanently altered how at least one generation perceived the landscape of this part of England, how they behaved in and reacted to it. They affected, indeed, not only the patterns of leisure use, but also the actual physical landscape itself. Some of Wainwright's routes are now so heavily used that their erosion is critical, and parts have had to be fenced off while others have had to be paved. Guidebooks translate experience into paper: they record, as well as prejudice, what their reader will see. But it is only with the advent of the paperback that the guidebook has become really portable, not just a thing to be consulted in the planning of a journey. And just as we today see so many tourists contorting themselves to see everything through a camera lens, so it is common to see walkers progressing reading their Wainwright, rather than looking at the rocks and stones and trees in earth's diurnal course. The landscape becomes its description and one must ask: can one know a landscape without living it? In time, in dwelling in it in sun and shower? But that is another story. 1st version printed as anonymous intro to Rev Joseph Wilkinson's Select Views in Cumberland, Westmorland and Lancashire (Ackerman, London, 1810).